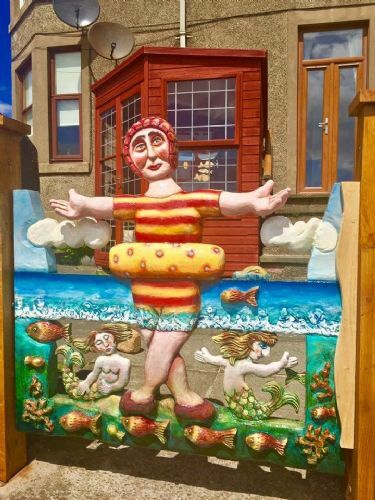 If your idea of tranquillity is to wake up to the sound of the waves lapping on a sandy shore then `Sunnyside` 86 Main Street, Lower Largo is the place for you. For your comfort facilities now include full SKY package, Xbox, IPOD Dock and wireless Internet, coupled with a wonderful open fire. 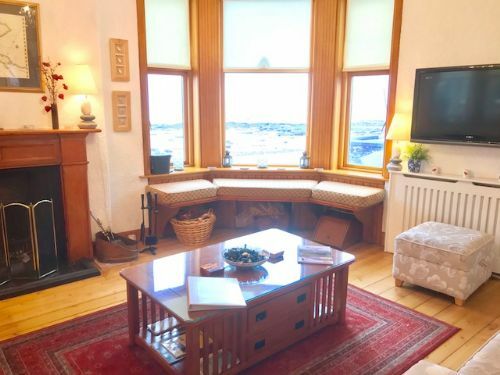 A characterful, welcoming and homely BEACH FRONT ground floor apartment with superb sea views set in the beautiful and historic village of Lower Largo, Fife. 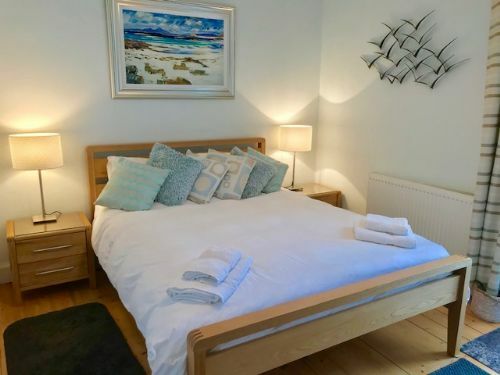 The property sleeps 4 very comfortably and has a double sofa bed and stow away single bed for those occasional unplanned visitors, is well appointed with the facilities you would expect from a luxury beach front property - the perfect place to unwind and get away from it all. 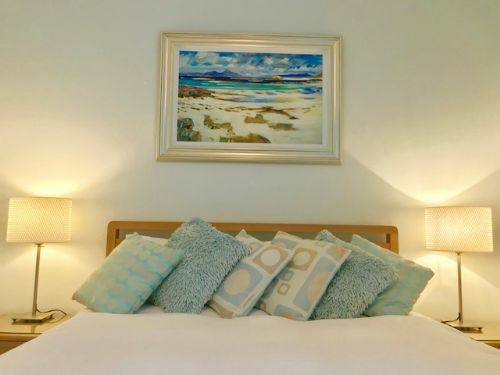 Situated adjacent to the slipway for the local Sailing Club this apartment has a long, clean and picturesque beach on its front patio. 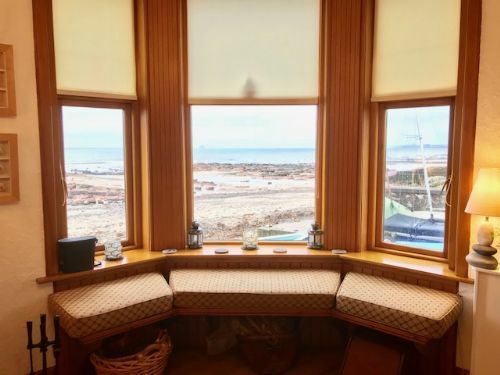 You can enjoy the privacy of your own patio whilst watching the walkers, beachcombers and kite flyers on the beach with the local boats sailing along only a few feet away. 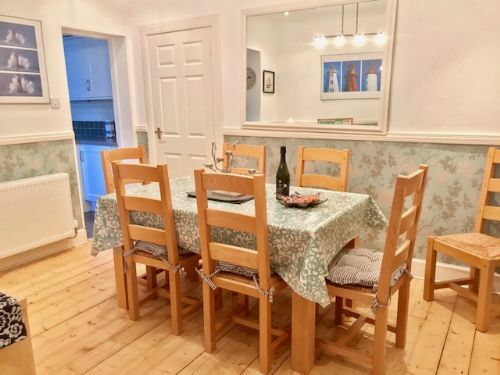 Easy access to excellent local restaurants only a stroll away yet close enough to all of the many wonderful facilities available in the wider East Neuk of Fife. Well behaved small dog welcome! 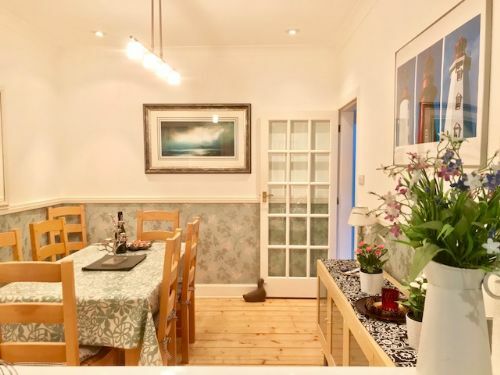 Entrance Hallway - spacious open hallway with large walk in cupboard providing perfect storage for golf clubs, pushchairs etc, stripped wooden flooring. 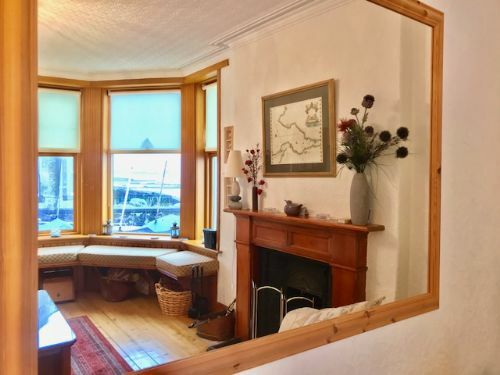 Sitting Room - This traditional sitting room is a relaxing space with a sea view bay window seat and original open coal/log fire. The luxury sofas and state of the art home entertainment system make this an ideal place to relax. 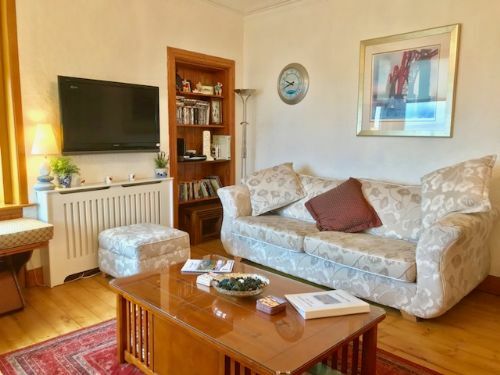 Equipped with all the latest technology including Plasma TV, SKY/VHS,DVD/CD player, Xbox and a library of CD`S, dvd`S, books and games to keep you and the kids entertained! A free and easy access WI-FI broadband connection is available. 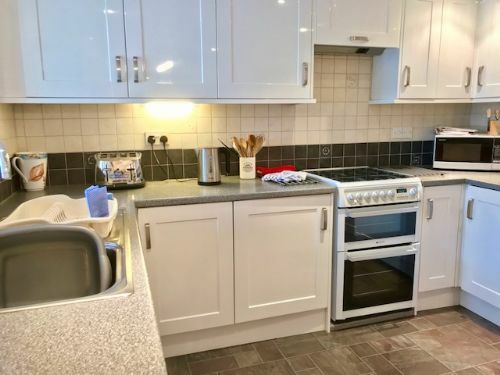 Kitchen - fully equipped with fridge,freezer, cooker, microwave, dishwasher along with washing machine. Dining Room - dining table which comfortably seats 8 and includes a sideboard which contains crockery for entertaining. The dining room also has a pantry cupboard. It contains an IPod docking system for your own choice of music whilst you eat!!. Master Bedroom with sea view - comfy king sized bed, hanging wardrobe and drawer units. The bed can be split to form two singles if required. Just off the bedroom, through french windows is the patio with direct access to the beach. Bedroom 2 - two comfy single beds along with hanging wardrobe and chest of drawers. Shower Room - generous sized shower cubicle, wash hand basin and w/c, fully tiled. Fabulous house, well looked after and everything we needed to make our stay comfortable. What a lovely please, we were very fortunate with the weather - clear frosty skies - very nice indeed. Accommodations 1st class - equipped with all our needs, save a butler. Location also spot on - parking not always easy but we managed. Local shops & The Railway personnel were very convivial and made us welcome too. Need to check the diary for our next visit. Many thanks all round. The cottage and its location are truly magical. The cottage itself is so well equipped, comfortable and feels like home. The location is unbeatable and what makes it is the summerhouse. We had amazing weather for November and the sunsets sitting in the summerhouse are just beautiful. We have enjoyed our chilled out time here so much we will be back for sure. Another great weekend at Sunnyside. We love the house and the view. Walks along the beach, fish teas at the Crusoe. We are never here long enough. Can't wait to return in 2017. We have had the most relaxing break in the perfect place in the a stunning location, two days in and we have already booked again for next year. It is a dream holiday location, such a comfortable please and you have thought of everything. We were blessed with good weather too, so lots of walks, bbq's and paddling in the sea - bliss! We had a wonderful time. The weather could have been better but thanks to an assortment of games, x box etc and lovely little summer house we had the most wonderful time. I have to say that over the years I have stayed in many accomodations in the Fife coast but never ever have I found one so well equipped. Absolutely everything is thought of and supplied. So thank you from myself and family for a wonderful holiday. 6th year in a row we've holidayed here, still love it. Our little slice of paradise! Looking forward to our next stay. Another lovely visit to this very comfortable cottage. This is our 4th stay at Sunnyside where we bring our elderly mums for a relaxing break. Last time for our own honeymoon in August 2015 and this time for our daughters wedding in Glenrothes. The house is so welcoming and well equipped, its true home from home. Will definitely be back as often as possible in the future. Many thanks. We did enjoy our stay very much - great accommodation, very cosy and comfortable, and very well equipped - one of the best equipped rentals we've had. It’s very sad to be home after a lovely week. We are very fortunate to go on holiday a few times during the year, but Lower Largo and the house are by far my favourite destination! "We have had a really lazy week, the car has barely moved and we have just enjoyed pottering about on this beautiful beach and, for once, loved having lots of time to read, paint and chill out. 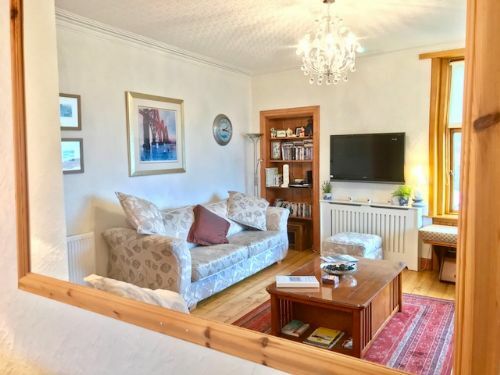 This lovely apartment has been perfect, just what we needed and not an easy place to leave"
"We have stayed all over the East Neuk but hadn’t tried Lower Largo until now. In many ways it is a more characterful village than the others, we loved the beach and the Railway Inn. 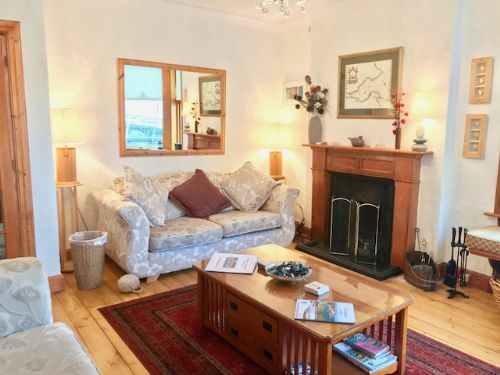 We are thoroughly relaxed your sitting room is incredible and how cosy we felt listening to the whoosh of the tide during the night"! 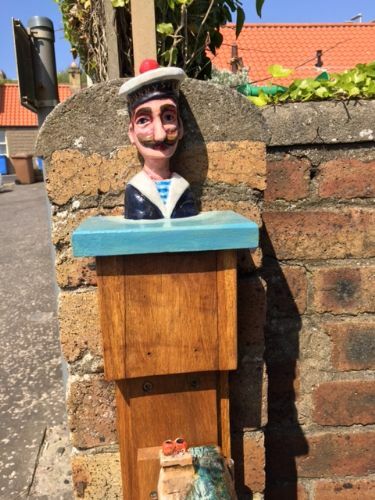 "Back again for a cosy Valentines weekend - discovered the handy bus service which allowed us a tipsy night at the lovely Ship Inn, Elie without having to worry about driving. 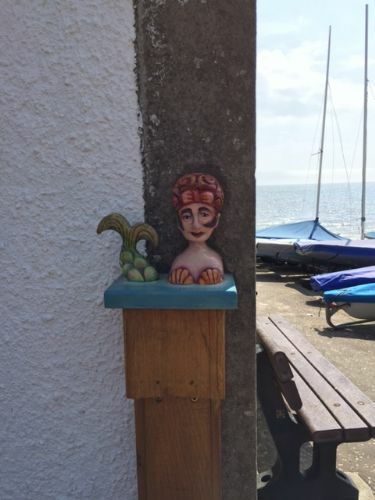 We are so at home here that we are hoping to book another week in August"
"A perfect location and lovely apartment, enjoyed simply looking out at the sea, beach and birds! Weather kind to us on the whole but experienced a rough crossing returning from the Isle of May! The was our first and hope not our last visit to this area"
"What a fantastic house, location is superb, the home touches perfect. 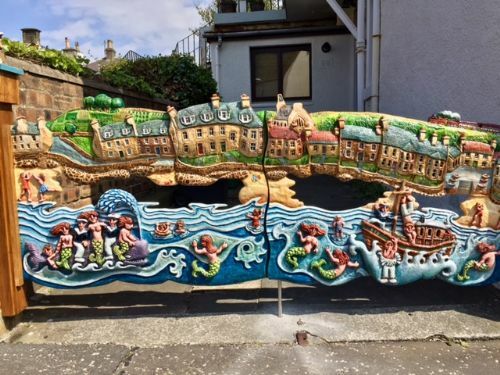 Have stayed in 8 or 9 in Lower Largo, this is by far the best"
"From the minute we walked into the house we felt at home, most relaxing and comfortable and cosy. Stunning views and walks. A perfect situation"
"Thank you for letting us stay in your lovely home, we have had a fabulous holiday! Our boys aged 6 and 9 have practically lived on the beach, making castles, rockpooling, walking on the beach in the dart, in the rain, in the sea (thank goodness for the washing machine) - Many thanks"
"The sea is our garden"
"I made castles with moats every day and I got my first wobbly tooth"
"This has been a good start to our holiday, we have already been soaked in the sea and had a great water fight"! Just to let you know my wife and I and Paddy the dog had a fantastic holiday in 86 Main Street. The accommodation was first class and the views were spectacular. The weather could not have been any better. We will definitely consider another holiday next year to this property. Accommodation was ideal. Very comfortable and with everything you could want. Amazing views. We have stayed in 86 Main Street twice now and will definitely be back. The property is exceptional, comfortable and equipped to a very high standard. The beachside location is perfect, especially for dog owners and the surrounding area is great, with plenty to see and do. 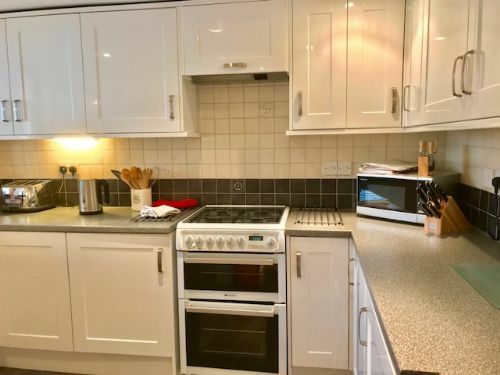 We can’t recommend this property highly enough. We could not fault this property, everything was as expected. Every room had been thoughtfully furnished and designed, the kitchen was well equipped. 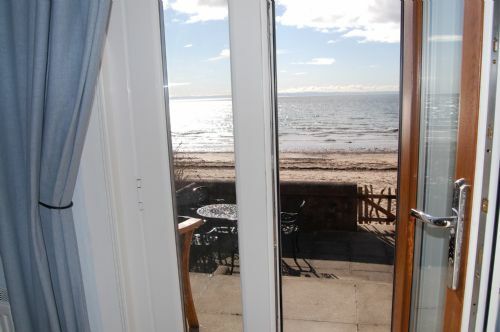 Access to the beach was perfect for dog walking, the summerhouse was perfect for mum, wonderful to sit on the window seat with a coffee early in the morning. We have visited this property several times and keep coming back. The location is amazing. We have young boys who can play on the beach whilst we sit on the patio. The views are beautiful and you will not find anywhere closer to the beach! The apartment has been refurbished to a very high standard and we can happily spend a week not travelling very far from this base.